While I believe in peace, even a peace testimony, my life has been spent amid the most formidable warmaking machine of all time, one it takes years of practice to learn how to ignore long enough to do or even think about much else. Alongside this have come waves of social upheaval, turmoil that has brought substantial change. Much of that change has been positive, but much has not, and as I write, the intensity and the stakes seem to ratchet up almost weekly. 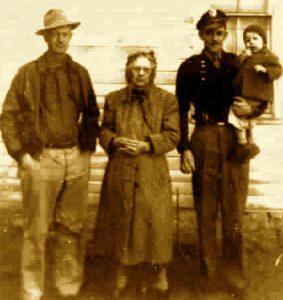 Born in wartime: four generations of Fagers, in St. Paul, Kansas, circa 1944. My father, a bomber pilot, is in uniform; I’m the babe in arms. It’s odd that so much of my attention has been consumed with these outward struggles. By temperament I’m a confirmed introvert, and a bookish one at that. Only occasionally have I gone running off to catch up with the latest flashy newsy thing, like those war correspondents who jet from continent to continent to keep abreast of the battlefronts. In fact, I often feel disdain for such novelty chasing. Instead I was drawn to what we have been told is a receding, increasingly irrelevant part of the times, namely religion; and in that field, to Quakers and Quakerism, one of the smallest and more obscure sects. It became the major setting for my personal work of figuring out what I could and did believe, and how to live, work & raise my children in a meaningful way. 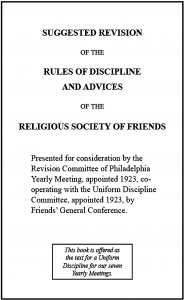 My entry in the Quaker History Nerds’ Hall of Obscure Fame: a Rediscovered Uniform Discipline for Friends General Conference, missing for 70 years. Normally such lingering over archival arcana points toward a slot in academia; but while I admire good scholarship, that wasn’t my path. Instead, those damnably interesting times kept intruding on my personal search and studies, and not only from the outside. The Quaker past, and the lives of earlier Quakers, which I found enlightening and often compelling, were repeatedly forged in the thick of worldly troubles: rarely in the lead, but often at the creative center (and not always for the better). And that Quaker past kept colliding with the “interesting times” of the present: from the English Civil War in the 1640s, to the U. S. Civil War two centuries later, and the plethora of ongoing American wars since 1945. And contrary to the popular wisdom of my younger years, it also turned out that scratching beneath the surface of the war machine on one side, and the so-called culture wars on the other, showed they are heavily shaped and driven by religion, particularly forms of Christianity. Further, it turned out that almost all the culture war conflicts were underway inside Quakerism itself; and for that matter, militarism had made its place here too. If burrowing into Quakerism was an effort to escape worldly tumults, it was an utter failure. I didn’t have to go looking for them; just trying to be a Quaker in late 20th century U.S. was enough to keep me stumbling over them, or to find them coming after me. As a result, Meetings is inescapably about more than me: Thomas Merton is here, as are the Berrigan Brothers, and even a couple of popes. (There’s some other excitement, including Dr. King’s Poor Peoples Campaign & its tragic collapse, facing off with the cops at Harvard Divinity School, choosing apples with Sam Levering; and it co-stars E.F. Schumacher, Milton Mayer, Harvey Cox, Jacques Ellul, numerous elders & even includes a cameo by George Fox). So my own inward seeking has often been like a ride in a kayak down a turbulent river: buffeted, run aground & sometimes even capsized by outward currents. Now, officially in retirement though hardly becalmed, I can see one potential consolation to these interesting times: they ought to make for readable stories. And in Meetings I’ve begun telling mine. 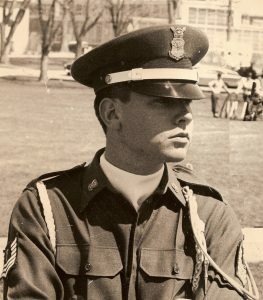 The author, gazing down one of the roads not taken, 1962. It describes my upbringing in a Catholic, military family, my break with both, the encounter with Quakerism, and the initial stages of my “spiritual formation” among Friends, during the Vietnam War and its aftermath, and marked by a personal quest for identity, faith and vocation. In conventional memoir terms, it’s a Quaker coming of age story, 20th century style. A vivid, lively, kaleidoscopic self-portrait of a fascinating Catholic-turned-Quaker journalist, writer and activist. 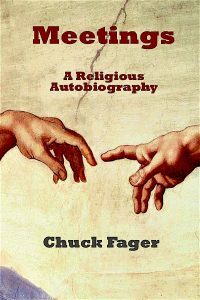 Chuck Fager’s autobiography is one of the best that I’ve seen of an aspiring nonviolent revolutionary’s Life in the Sixties. (The early Seventies are covered, too, in which he and other radicals took a more conservative turn.) Fager seems to be everywhere, providing revealing insights from interviews with Phil Berrigan and E. F. Schumacher, among others. He also provides wonderful portraits of Quakers who made their mark on the world and who deserve not to be forgotten, Sam Levering, Morris Mitchell, and Louisa Alger, among them. Even topics such as “how I came to love the Bible” are presented in a sprightly and thought-provoking fashion; one of his unforgettable characters, the Prophet Jeremiah, hasn’t been alive in thousands of years! Meetings is available here, and at Amazon, also for Kindle. I hope “Louis Alger” is really Louisa Alger, my friend. Better read the book to make sure, Allan. Let me know what thee finds. And if there’s a typo, I blame it (as always) on “Auto-IN-correct” . . .
We will definitely get one of these for the library of the Atlanta Friends Meeting, and I definitely look forward to reading it. Thanks for writing it!